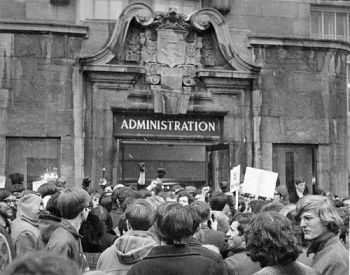 It wasn't all be-ins; in the Fall of 1968, for instance, McGill political science students occupied that department's offices, demanding student participation in department committees. Alan (who was taking Poli Sci 100) spent a lot of time at the occupation, organizing poetry and musical events. Photo by by Irvin Shizgal. More of Irvin's 1969 photos on Flickr.com.